A beloved picture book from two-time Caldecott Medal award-winner Sophie Blackall that transports readers to the seaside in timeless, nautical splendor! Watch the days and seasons pass as the wind blows, the fog rolls in, and icebergs drift by. Outside, there is water all around. Inside, the daily life of a lighthouse keeper and his family unfolds as the keeper boils water for tea, lights the lamp's wick, and writes every detail in his logbook. 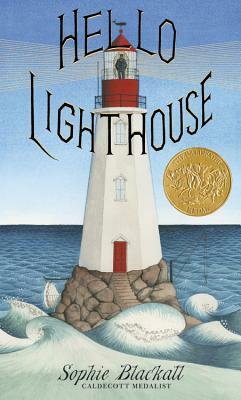 Step back in time and through the door of this iconic lighthouse into a cozy dollhouse-like interior with the extraordinary award-winning artist Sophie Blackall. Sophie Blackall is the bestselling and Caldecott medal-winning artist behind Finding Winnie: The True Story of the World's Most Famous Bear. Her work has appeared in the bestselling Ivy and Bean series, many award-winning picture books, a global pro-vaccination campaign, and on a renowned NYC subway poster. She lives in Brooklyn with her family.